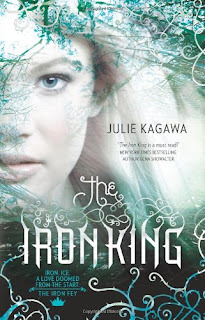 I loved the adventure Julie Kagawa took me on in The Iron King. It reminded of so many different stories that I've love. Labyrinth, Alice in Wonderland and a little The Never Ending Story. Not in a copycat kind of way at all, this story definitely had it's unique voice. It was a wild ride from beginning to end and I found myself not able to stop reading at some points. The story flowed easily from one conflict from the next and I found it easy to connect to the characters. I loved Meghan in the book. Probably one of my favorite female heroines. She isn't a complete dip that kept obsessing over every little decision. She is strong when she needs to be and weak when anyone would be. She slowly comes into her true self, rather than walking into Faery and having super powers out of nowhere. I really liked the progression of her character in this book and am excited to see what new surprises lie in store for the rest. Puck/Robbie is the easy going best friend who obviously has a crush on Meghan. I enjoyed the way his character ligthens the mood. I also like how Julie fits the lore of his character into the story as well. Although I could never picture Meghan with him, he reminds me of every girls best guy friend that is simply a friend. Ash on the other hand, I loved from the minute he was introduce. There is just something about the dark brooding type. I like the fact that he is kind of a villain, not the perfect prince charming. It gives a little more depth to his character. Besides who isn't a villain in the land of Faery. How could I not adore Grim, the matter of fact cat, he says how it is and doesn't spare feelings. I'm interested to see how he uses the "little favors" he seems to be collecting. I never thought I was into Fey lore, or books about it. The more I read the more I enjoy it. It's a magical world that isn't poises and roses. The Fey are mean spirited and selfish and I'm glad it was kept in tact in The Iron King. The Iron Fey make perfect sense and fit into the story well. What a great job. The only thing I was a little disappointed in was the romance between Meghan and Ash. I felt I needed a little more to make it believable. I kind of feel like there is more there. He never really acted like he hated her and had shown up in the mortal world which made me wonder how long he had been watching her. There is still much that is a mystery. I can only assume that their story will evolve more in the later books and this was simple the door that leads to that. Overall what a great book. I couldn't put it down and I'm anxious to get the rest of the books. I'm so glad they are all already out so I don't have to wait.